Eastern senior Kelsey Casto, right, bumps a ball in the air during Game 1 of Wednesday night’s Division IV district semifinal volleyball match against Pike Eastern at Jackson High School in Jackson, Ohio. Eastern sophomore Olivia Barber (12) hits a spike attempt during Game 3 of Wednesday night’s Division IV district semifinal volleyball match against Pike Eastern at Jackson High School in Jackson, Ohio. JACKSON, Ohio — Hoping the third time is the charm. 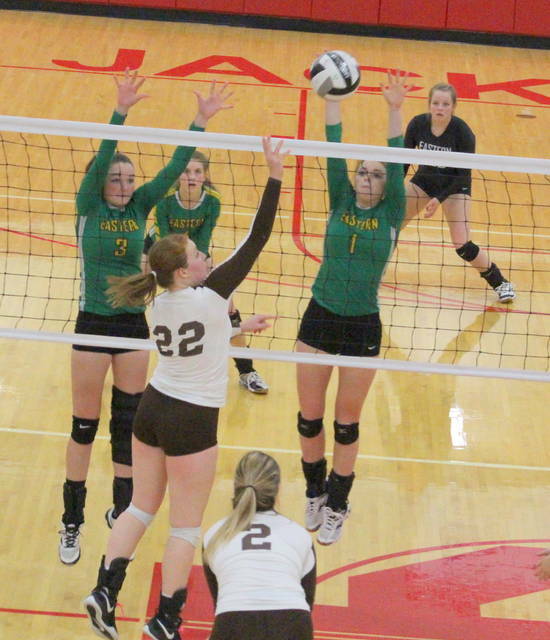 The Eastern volleyball team will be facing a familiar foe in its first district title match in three years after claiming a 27-25, 21-25, 25-19, 25-15 victory over Pike Eastern Wednesday night in a Division IV district semifinal contest at Jackson High School in the Apple City. The battle between Lady Eagles proved to be formidable as both second seeded Eastern (19-5) and third seeded Pike Eastern (15-9) battled through 22 ties and 14 lead changes over the course of three games. 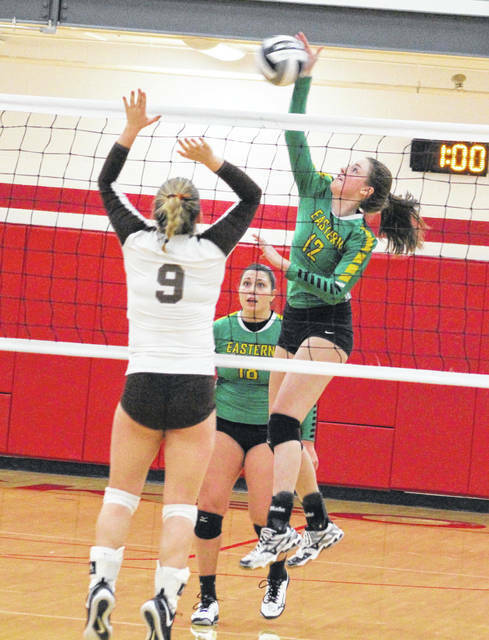 The Green and Gold, however, never trailed after 8-7 in Game 3, built a lead as big as eight points and ultimately took a 2-1 match lead with the six-point triumph. Eastern established a quick 6-0 cushion and led by 10 points on five different occasions in the finale, allowing the Lady Eagles to cruise into Saturday’s championship match with top seeded Portsmouth Clay. 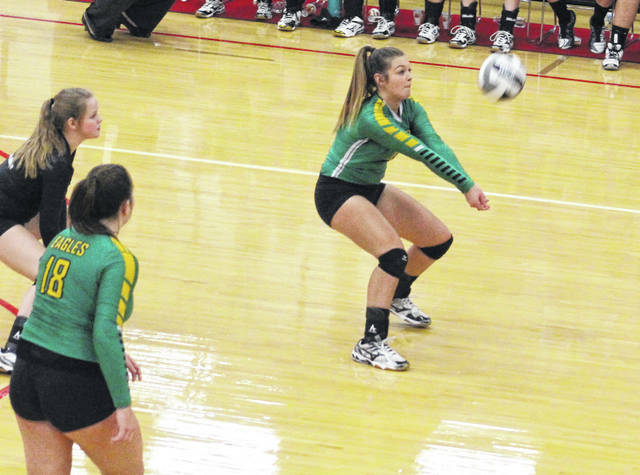 The Lady Panthers — who defeated fifth seeded Federal Hocking 25-12, 25-15, 25-15 in the other D-4 semifinal — have eliminated Eastern in the district semis each of the previous two postseasons. The Lady Eagles will not only be aiming for their first regional appearance since 2015, but will also be gunning for the program’s 10th district championship in school history. Following the match, EHS first-year coach Mykala Sheppard noted that the best thing about Wednesday night’s triumph was the fact that everyone was involved in the outcome. “These girls have worked really hard to get where they are right now. We’ve had to adjust roles, figure things out on the fly and make things work as we go,” Sheppard said. “Over the last few weeks, we’ve been figuring things out in a pretty successful manner. We still have one more test in front of us, but I am proud of the girls for what we did tonight. There were a dozen ties and seven lead changes in the opening game alone, and neither squad led by more than four points throughout Game 1. Pike Eastern held a game point opportunity at 24-23, but the hosts scored two straight points before finding themselves deadlocked at 25-all. The Green and White came up with the last two points for a minimal decision and a 1-0 match lead. Eastern led 2-0 in Game 2, but the Brown and Orange tied things up at five and never trailed the rest of the way. Pike Eastern built its largest lead of the night at 24-18 and ultimately held on for a four-point win while tying the match at one apiece. Facing an 8-7 deficit in Game 3, the Green and Gold rallied with three straight points and eventually found themselves tied at 10-all. Eastern followed with six straight points and led by as many as eight points (21-13) before closing out the six-point win for a 2-1 match advantage. Eastern’s first double-digit lead in Game 4 came at 18-8, and the guests never came closer than seven points (22-15) the rest of the way. Kelsey Casto led the Eastern service attack with 18 points and five aces, followed by Ally Barber with 10 points and Caterina Miecchi with nine points. Alexus Metheney and Jenna Chadwell were respectively next with five and four points, while Haley Burton and Kylie Gheen rounded things out with two points and one point. Miecchi chipped in three service aces, with Chadwell and Barber also adding one ace each. Miecchi led the EHS net attack with 13 kills, followed by Olivia Barber with nine kills and Ally Barber with eight kills. Chadwell and Layna Catlett also contributed five kills and four kills, respectively. Catlett produced a team-high six blocks, with Ally Barber adding three blocks. Sydney Sanders also came up with a team-best 15 digs, while Miecchi and Ally Barber each had 11 digs for the victors. Morgan Legg paced Pike Eastern with 10 service points and Skylar White added six points, while Nadee Lester, Brandi Neace and Kaytlyn Newsome each had five points. Newsome led the guests with nine kills and Lester was next with six kills. Legg also chipped in five kills in the setback. When asked about reaching the district final in her first varsity season at EHS, Sheppard expressed a great sense of pride in the accomplishment. However, the rookie mentor is satisfied just yet … and she’s hoping her troops feel the same way. “Honestly, this means a lot to me,” Sheppard said. “I started this season not knowing a darn thing about what I was doing at this level. To see the potential in these girls and work so hard to get where we are right now, it feels really good. But, to be fair, we want to make it out of Jackson … and that’s the goal now. The Division IV final with Portsmouth Clay will start at 3 p.m. Saturday.